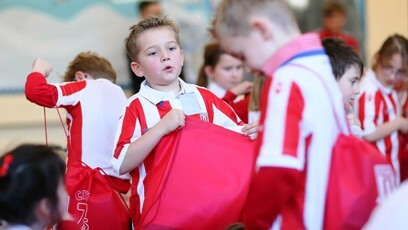 Stoke City are to give 16,000 match tickets and 8,000 match shirts free to local schoolchildren this season. The Potters are expanding their acclaimed City 7s scheme, which currently sees 1,000 Year Two children presented with a shirt and two tickets to watch Mark Hughes’ side in Premier League action at the bet365 Stadium. The Club are to roll out the scheme across Staffordshire as they look to engage with more young football fans in what is thought to be the biggest initiative of its kind ever undertaken in the English game. Stoke City Chief Executive Tony Scholes said: “City 7s has proved to be an enormously successful way of introducing year two pupils to their local club and this year we want to reach out to every seven-year-old in Staffordshire.